I am not a fan of my skin. I never have been. It's blotchy in places, I have large pores and am prone to cystic acne. I have tried so many products to get the skin I dream of having. None of them worked any miracles. My solution? Accept my flaws (this is the most important thing that I cannot stress enough), stop wasting money and cut down on the chemicals. My skincare routine is not 100% natural, but it's fairly close. First, I switched out my eye makeup remover for olive oil. It does the trick and I always have it available. I know what's in it and it provides extra moisture to the area around my eyes. I dissolve 1/2 to 1 teaspoon of Epsom salt in 1/4 cup water and add about 5 drops of iodine and keep it in a plastic bottle. About 20 minutes before I wash, I swipe it on and let it dry. It helps bring blackheads to the surface to be washed away. You can find Epsom salt for as little as a dollar. It's also something that I always have on hand. I use Dr. Bronner's to wash my face. I use a 3oz plastic bottle and dilute it 1:1 with water. It doesn't take much to clean your face. It's very thin and watery and easy to use too much. Don't be tempted, though. It only takes a couple drops. I don't recommend using the peppermint soap. It might be too harsh. Try rose, almond or lavender. If you are acne prone, you can always try the tea tree. A 32 oz bottle of Dr. Bronner's will cost you about $17 and can be used for so many things. It's almost always diluted when used so 32 oz goes a long way. Much better than the $20+ I was spending on Clinique face wash. I have also started making my own toner by mixing 1 part apple cider vinegar with 2 parts water. The smell isn't great when putting it on, but it quickly disappears. I love it because it is so simple, cheap and good for your skin. Again, apple cider vinegar is something that I always have on hand. In the summer when have an abundance of cucumbers from the garden, I make a cucumber toner. If you have a juicer, mix the juice from 1 cucumber and 1 lemon with a teaspoon of honey and keep in the refrigerator. If you don't have a juicer, you can give the cucumber a whirl in the blender to make a puree and run it through a mesh sieve or cheesecloth. During the day, I use a store bought moisturizer with an SPF. At night, I use a thin layer of coconut oil. I whip 1 cup coconut oil with 1 teaspoon of vitamin E oil in my Kitchen Aid mixer until it's light and fluffy and keep it on hand in a glass jar. 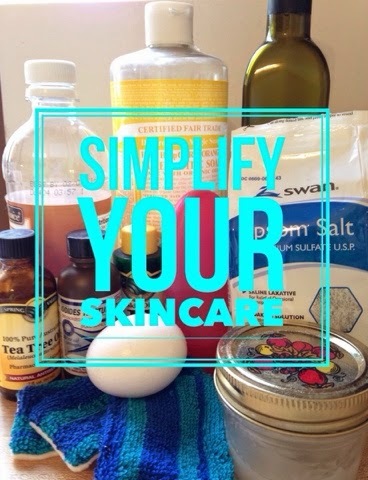 When it comes to breakouts, I spot treat blemishes with tea tree oil. Also, once a week or if I have a large break out, I use an egg mask. I mix 1 egg white with 2 teaspoons of lemon juice and 1/2 teaspoon of honey until it's frothy. I use a cotton ball to put it on, wait for it to dry and rinse it off. It tightens pores and is great for acne. If used too often, though, it can be very drying. Since I've started this routine, I haven't had a problem with cystic acne. I can't tell you how happy this makes me. Even though I usually only had a couple blemishes at a time, it was still painful and ugly. Mostly painful. I feel for people who deal with widespread cystic acne. I still get the occasional garden variety breakout, but it's easily treated and doesn't bother me. I should also add that since I have made it a point to drink my 8 glasses of water a day, I no longer have a problem with dry patches of skin on my face. I think that covers everything. I like knowing the ingredients of the products I put on my skin. I also like that I am saving a ton of cash!